Dr. Abby Barnes: Right...rejection kills. Disappointment only maims. The legend of Cyrano de Bergerac is about a man who harbored a great love for the beauty Roxanne, but helped his handsome, less romantic friend, Christian court her by writing adoring letters to her in Christian's name. This story, made famous in the seventeenth century, has been retold numerous times in motion pictures. Most recently, both Steve Martin (Roxanne) and Gérard Depardieu have taken on the role of the great romancer. In The Truth About Cats and Dogs, there is a slight twist on the classic story. Janeane Garofalo is placed in the role, and while this film isn't a direct take off of Cyrano, the underlying story is still present. The Truth About Cats and Dogs is not only the title of the film, but also the name of Dr. Abby Barnes' (Garofalo) hit radio show. For the most part, the typical calls range from a dog owner who has trouble getting her canine toilet trained to another whose love for his cat seems to go a bit too far. On the last call of the day a photographer named Brian (Chaplin) calls in with a strange problem: he has an angry dog on rollerskates careening through his studio. Abby talks him through the soothing steps to calm the dog and, as a show of thanks, Brian invites her out for a drink. Abby accepts but is worried about her looks, so she gives Brian a false description of herself. Actually a 5' 1" brunette, she tells him that she is 5' 10", blonde, and beautiful; this happens to be the description of her neighbor Noelle (Thurman). Soon Brain is in love with the looks of Noelle, but the personality of Abby. Part of the reason The Truth About Cats and Dogs works is because it deals more with feelings than most other romantic comedies. Much like in real life, personality means more than looks, and in in this film it doesn't take long to realize that while Thurman's character is amazingly beautiful, Abby runs circles around her. Also in the case with most romantic comedies, the ending is known before the first frame of the film is shown. Yet, with The Truth About Cats and Dogs, the situations that the characters go through seem inspired and wholly original. Consider the scene involving a sick turtle and a plastic glove: in most films this moment would be played for gross-out style laughs; yet in this scene, it is much more humorous, and in a weird sort of way, touching. Garofalo, in her first starring performance (after shining in supporting roles in films like Bye Bye Love and Reality Bites), is wonderful as Abby. In her previous films, she has been shown as drab and less attractive than her female co-stars—Ryder in Reality and numerous beauties in Love. Here, she is given the chance to showcase her talents and she does so quite well. It is a pleasant surprise that Garofalo, a known comedic performer, handles the dramatic aspects of the film just as well as the humor. Thurman develops Noelle, not as an adversary to Abby, but as a friend who sees both sides of the situation and handles them accordingly. Chaplin does a nice job as Brian and has good chemistry with both of the two lead actresses. The most amazing thing about Chaplin's performance is that he never lets himself get overshadowed by Garofalo or Thurman and holds his own throughout the film. Image Transfer Review: Presented in its original aspect ratio of 1.85:1 with anamorphic enhancement, The Truth About Cats and Dogs comes off looking well on this new DVD from Fox. Both sharpness and detail are fine, and colors are vibrant, while the muted grays and browns in the film look good. No print flaws or scratches are noticeable. There are a few moments where pixelation and edge enhancement are a problem, but neither ever becomes big enough to worry about. Audio Transfer Review: Anyone who reads my reviews on a regular basis knows my extreme hatred for sound mixes on comedies. The Truth About Cats and Dogs doesn't break any new ground unfortunately, although what is here does sound good. Dialogue is clear and easily understandable and the brief moments where the score kicks in sounds nice across the front channels. English and French Dolby surround tracks are also available. 5 Other Trailer(s) featuring Nine Months, For The Boys, Norma Rae, 9 to 5, and Working Girl. Extras Review: The theatrical trailer and two TV spots for The Truth About Cats and Dogs are available as well as trailers for Nine Months, For The Boys, Norma Rae, 9 to 5, and Working Girl. 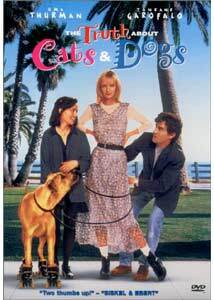 Whether or not The Truth About Cats and Dogs is your cup of tea is unknown to me, but I love this movie. It is undoubtedly one of the best romantic comedies of the past ten years and it deserves a spot in your collection. Recommended.